As per manufacturer's data sheets, a 12V rechargeable lead-acid battery should be operated within 10. IV and 13.8V. When the battery charges higher than 13.8V it is said to be overcharged, and when it discharges below 10.IV it can be deeply discharged. A single event of overcharge or deep discharge can bring down the charge-holding capacity of a battery by 15 to 20 per cent. Input from the battery under test is applied to LM3914 1C. This applied voltage is ranked anywhere between 0 and 10, depending upon its magnitude. The lower reference voltage of 10.IV is ranked '0' and the upper voltage of 13.8V is ranked as '10.' (Outputs 9 and 10 are logically ORed in this circuit.) This calibration of reference voltages is explained later. 1C 74LS147 is a decimal-to-BCD priority encoder which converts the output of LM3914 into its BCD complement. The true BCD is obtained by using the hex inverter 74LS04. 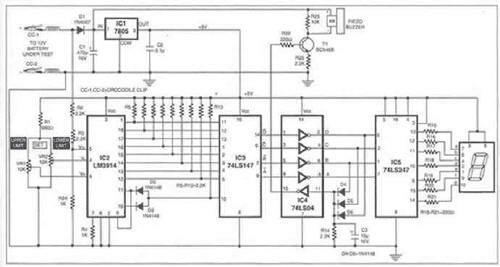 This BCD output is displayed as a decimal digit after con­version using IC5 (74LS247), which is a BCD-to-seven-segment decoder/driver. The seven-segment LED display (LTS-542) is used because it is easy to read compared to a bar graph or, for that matter, an analogue meter. The charge status of the battery can be quickly calculated from the display. For instance, if the display shows 4, it means that the battery is charged to 40 per cent of its maximum value of 13.8V. Another simple combinational logic circuit can also be designed that will sound the buzzer when the display shows 9. Further charging should be stopped at this point in order to pre­vent overcharge. Charge Monitor for 12V lead acid battery electronic circuit. Automotive electronic circuits and schematics.